Health insurance is always a key requirement for a visa application with the German embassy and possibly later for a visa extension at the immigration office (Ausländerbehörde). Therefore, anyone applying for a visa for Germany or any other EU member country must be able to prove that they have adequate travel insurance. Without Incoming Health Insurance, a visitor's visa could be denied and entry into Germany could be refused. You can find an inexpensive health insurance for foreign guests and visitors from € 30/ 30 days (max. 2 years) that you can apply for directly online. The monthly premiums are very reasonable and this insurance complies with the visa requirements for a ShengenVisa and can be used for a visa application or visa extension. After filling out the online application you will promptly receive all documents via email. You can then use these documents at the local immigration office (Ausländerbehörde) or embassy to apply for a ShengenVisa or to extend an existing visa. 2. Not all Incoming Insurances are recognized by the embassy or immigration office! Please be aware that the insurance for foreigners must comply with the regulations for a ShengenVisa as agreed upon by the Council of the European Union on 13.07.2009. This is very important for both, embassies abroad and the immigration office in Germany. The Incoming Health Insurance for foreign guests must be valid in all Shengen states and provide coverage of at least 30,000 Euro. The Travel insurance must be obtained BEFORE applying for a visa. The travel insurance from "Hanse-Merkur Versicherungsgruppe" (from 30 € / 30 days, for a maximum of up to 2 years) meets the regulatory requirements of the embassy and immigration office for a Schengen Visa. Therefore, in our experience it is recognized as proof of insurance by all foreign authorities (Ausländerbehörde) in Germany. Another advantage: You will receive your insurance certificate quickly and easily via email. Simply print it out and present it to the embassy or immigration office with your visa application or renewal for Germany or any other Schengen country. Unfortunately, illnesses and accidents can never be completely avoided, and especially in Germany those are always associated with high costs. A dental treatment or a necessary operation in a hospital after an accident can easily cost the foreign guest or the German host more than 1,000 Euro. On the other hand, a travel health insurance for foreign guests is not expensive at all, starts at about 1 Euro per day, but can in a worst case scenario prevent financial ruin for someone affected. with the Foreigner's Registration Office (Ausländerbehörde) and inviting foreigners to Germany? If an applicant does not have the financial means for health insurance abroad, then the inviting host may purchase the insurance for the guest. You are taking on a relative high financial risk through the invitation of the foreign guest and when signing the Declaration of Obligation (Verpflichtungserklärung). Therefore, we recommend that you definitely take out an insurance package that combines visitor's health insurance and accident / liability insurance. By signing a Verpflichtungserklärung for foreigners in Germany you pledge to cover not only all costs associated with the trip of the foreign visitors, including the cost of any medical treatment, but also to reimburse potentially incurred public expenses. And that can get very expensive! From our experience, we can recommend the visitor health insurance by Hanse-Merkur Versicherungsgruppe (from 30 Euro/ 30 days) in combination with an accident and liability insurance for the foreign guests (from 2 Euro/ month additionally). To include an personal liability insurance or a personal liability/accident insurance package simply answer the question "Do you want to take out liability or accident and liability insurance?" from the online form with "Yes". This package is highly recommended because for a relatively small amount you get additionally a liability insurance and an accident insurance and are now well covered for the most financial risks. Can I use this health insurance when applying for German Visa? Yes, the insurance coverage meets the requirements for a ShengenVisa as agreed upon by the Council of the European Union, 13.07.2009 and can therefore be used for a visa application or visa extension for Germany or any other Schengen state. The required minimum coverage of 30,000 Euro is guaranteed and will be stated on your insurance policy. After applying online you will receive all insurance documents within minutes via email. Simply print and take them to the embassy or consulate. The German Embassy requires a minimum coverage of 30.000 Euro and this should be stated on the insurance policy. Does this policy comply with the requirements? Yes, the insurance coverage meets the requirements for a Schengen Visa and can be used for visa application or visa extension. The required minimum coverage of 30,000 Euro is guaranteed and is stated on the insurance policy. Is this Travel Insurance recognized by the immigration authorities in Germany (Ausländerbehörde) ? 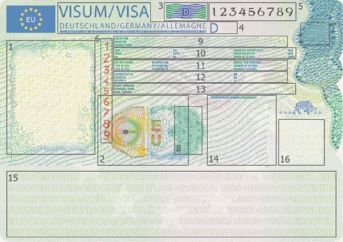 As proof of insurance for a Formal Obligation (Verpflichtungserklärung) or a Visa Extension ? Yes, this health insurance meets the standard requirements for a visa application (Schengen Visa) and guarantees the minimum coverage of 30,000 Euro. According to our experience, the insurance certificate is recognized by the immigration office in Germany, as well as by the German embassy abroad. Do I receive proof of insurance that can be submitted to the embassy or local immigration office? Once you have submitted the online application for your travel health insurance and if all information is complete and valid, you will receive a printable insurance certificate via email within just a few minutes. You can generally already use this to apply for or extend your visa or residence permit. If the term of the health insurance is for more than 120 days and you have provided a German address, your documents will also be sent by mail. In our experience, this travel health insurance is recognized as proof of insurance by the immigration authorities in Germany. In most cases it is sufficient to simply present a printed out copy to the local immigration authorities in Germany or the German embassy abroad. What happens if a foreign guest does not receive a visa? If a guest or visitor cannot enter Germany, you can cancel the contract and apply for a refund of your insurance premium. However, in order to get a refund of the insurance premium it is always necessary to promptly cancel the contract in writing and to include a copy of the notice of refusal from the respective embassy or consulate. You will receive a refund of any paid premiums within four to six weeks. For a refund, there will be a one-time processing fee of only five Euros. How many months should be entered on the application form for "term of insurance", if you don't exactly know how long the stay in Germany will be? It makes sense to always indicate the maximum amount of months that might be spent in Germany when answering the question "Term of Insurance" in the Online Application. If there is a change in your schedule, notification must be made either by letter, fax or email. The insurance contract may be extended or cancelled in accordance with the tariff regulations. Can you use this health insurance for a Schengen Visa? Yes, the health insurance coverage meets with the regulations for a Schengen Visa as agreed upon by the Council of the European Union on 13.07.2009 and can therefore be used for a visa application or extension. The required minimum coverage of 30,000 Euro is guaranteed and is stated on the certificate. After filing your online application, you will receive all insurance documents via email within minutes. Simply print these and take them to the German embassy or consulate. In our experience this health insurance for foreigners in Germany is recognized as proof of insurance by all local immigration authorities (Ausländerbehörde) in Germany.